We know this is long but please read this. Because of the unintended consequences of a law passed to simplify Amusement & Recreation in Washington State in 2015 ALL martial arts schools have been forced to charge up to 10% sales tax on their services starting in 2016. This is NOT normal treatment under state law and affected ONLY martial arts schools and NO OTHER similar businesses like yoga, dance, ballet or gymnastics. If this doesn’t affect you now it IS affecting your friends and family and WILL affect your children and grandchildren for generations to come. 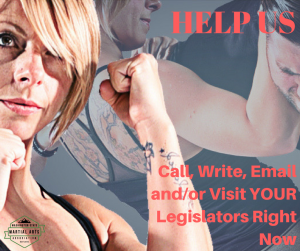 You can help eliminate this UNFAIR AND UNJUST TAX, remove the obstruction to access of self-defense and martial art training this creates and repair the damage done to the businesses providing these vital services across Washington State. We REALLY can fix this. It CAN be done and this post will show you how. And, all it will take is a couple MINUTES of your time to make a few phone calls and send a couple emails/letters to your legislator, today, and over the next couple months. 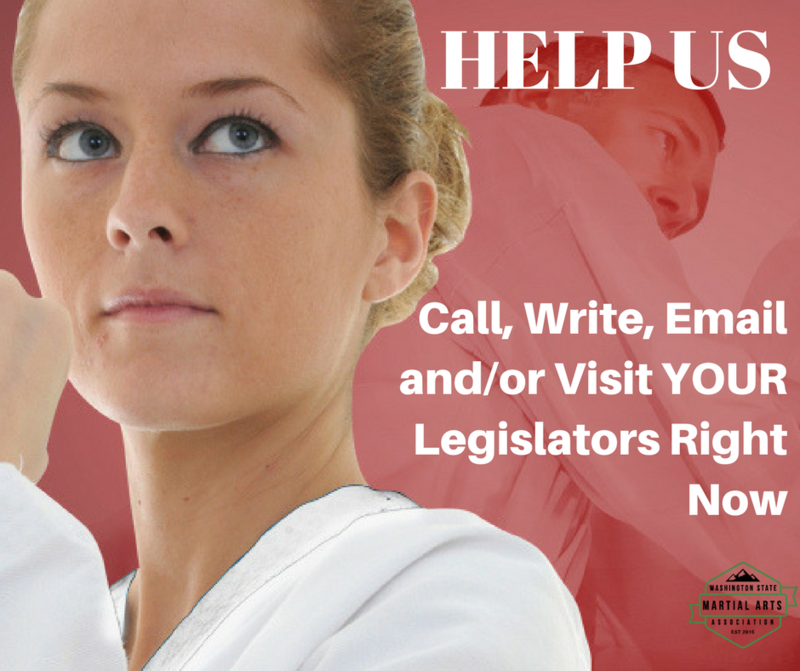 The WSMAA has been working with legislators since Oct. 2015 on this issue. Last year we got 96-0, UNANIMOUS support, in the House last year but couldn’t get a vote in the SENATE for purely political reasons. But we kept working all summer and fall and we have GOOD NEWS! RIGHT NOW new legislation has been introduced in the House of Representatives AND the Senate to fix this. There is overwhelming bi-partisan support and dozens of sponsors! We have Rep. Cindy Ryu in the House and Sen. Judy Warnick in the Senate to thank for being leaders and prime-sponsors. “In 2015, HB 1550 (Carlyle) passed with overwhelming support of the Legislature. The goals were to clarify and fine tune a section of the state tax code by providing an easy to follow list of things that qualify as physical fitness that are subject to sales tax. The rest of the items are classified as service and are not subject to sales tax. The bill did not provide an exemption; we simply tried to clarify what is and is not subject to sales tax. P retty clear cut but, sadly, it appears one of the bills has already stalled in the House Finance Committee. As a very small Association we’ve done what we can. NOW we need YOU to tell YOUR legislators you support this legislation and want a final bill to GET A VOTE on the floor of the House AND Senate as soon as possible. This is NOT a controversial piece of legislation and shouldn’t be held back to be used in budget negotiations. This tax is WRONG. This tax is UNFAIRLY applied. This tax is DAMAGING small businesses. Fixing it is their responsibility and is the RIGHT THING to do. 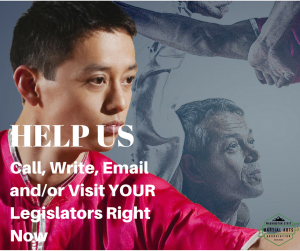 If you think self-defense and martial arts instruction should be treated, and taxed, as an educational SERVICE and NOT a retail item help us help YOU. 3. Copy and keep their phone, mailing address and email addresses. 4. 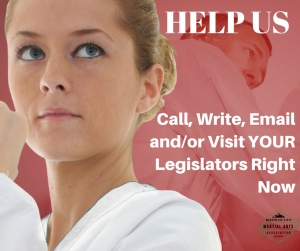 Contact your TWO Representatives and ask them to support HB 1032. Do this by phone, email and letter and even in person if you can! Always be calm, respectful and courteous. Tell them you are a constituent and where you live. Tell them why you feel this shouldn’t have happened in the first place and how disappointed you are it wasn’t fixed last year. If you’ve been affected tell them how. Tell them you want the House Finance Committee to get it out of committee NOW because it fixes a mistake and is non-controversial. Ask them to make sure the House of Representatives gives it a vote on the floor early and before the budget negotiations get out of control. Thank them for their support last year. They voted 96-0! 5. 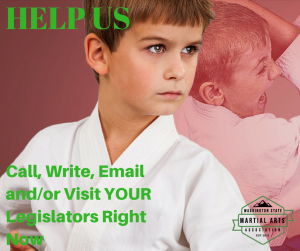 Contact your Senator and ask them to support SB 5220. Do this by phone, email and letter. Tell them how disappointed you are the Senate wouldn’t allow the bill to get a vote last year and why you think fixing it this year is important. Tell them you want the Senate Ways & Means committee to give it a public hearing AND get it out of committee NOW because it fixes a mistake and is non-controversial. Ask them to make sure the Senate gives it a vote on the floor EARLY before the budget negotiations get out of control. 6. Pay attention to this issue. You might need to do this a couple more times. 7. We may need people to attend a public hearing or a rally at the Capital. 8. COMMENT on this post. 9. LIKE and SHARE this post. 11. SHARE and LIKE everything we post so we can get the word out.